Tired Of Your Old Paver? Call today for professional removal and replacement services! Pavers are hard-wearing and durable, making them an excellent choice for both driveways, patios and any other part of your home or commercial property. Over time, though, it is possible for these stones or bricks to become damaged or for their colors to fade. Our team can quickly remove any damaged units, replacing them with carefully-matched new ones. Because these stones and tiles are designed to be used all year round, they can suffer from wear and tear like any other surface. Contributing factors such as extreme temperatures, extremely heavy traffic or a lack of brick sealant can cause bricks to fracture and colors to fade. This damage can be widespread or confined to only one area of your property; in either case, our team is ready to help. Our team has access to a huge number of paver styles, colors and shapes, allowing us to match your property’s existing design. We’ll carefully test the replacement pavers against the bricks we’re replacing, in order to ensure that the new ones blend in with the rest of the surrounding design. One of the many advantages that pavers have over stamped concrete is that we can easily replace just one area at a time, even unit after unit if necessary. Broken bricks or stones can be extracted without disturbing their neighboring units, which means we can quickly bring your driveway, patio or walkway back to perfect condition. Our team will ensure that your new pavers are securely installed and sealed in alongside the rest of the surface, giving you an attractive, durable surface you can count on for years to come. Whether your property has a few broken bricks that need replacement, or a whole area that’s been discolored by the sun, our team can restore it to its original beautiful condition. To find out more about the services we provide in the greater Los Angeles area, get in touch with our experts at S&P Hardscape Remodeling today. 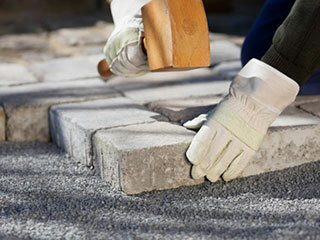 How difficult is brick paver repair? Repairing a brick paver structure can sometimes be more complex than planning and creating the structure in the first place. It requires first a thorough inspection of the damage and identifying the cause, which is possible only with extensive experience. The reasons can vary from poor original construction (inadequate compaction, missing edging, low-quality materials, lack of joint stabilization, etc), to geographical/landscaping flaws (run-off slopes, improper drainage provisions, creeping roots, and even an insect infestation). Once the root cause is identified, the structure needs to be disassembled and reassembled again, taking into consideration all the causes that damaged it originally. If you want to avoid a repeat disaster, it is advisable to engage a professional to do the job properly. If the structure in question is a simple driveway surface, then the repairs may not be as difficult, and simply replacing the damaged bricks could be sufficient. Is there a way to keep pavers from sinking? All pavers, including concrete, bricks and stones, tend to slightly sink over time because the ground settles. However, premature sinking can indicate a critical problem. In cold climates with extreme temperature changes, the soil freezes and thaws, expanding and contracting. If the soil settles at a lower level than it did before, the pavers will appear sunken. Another possible problem is water erosion – if the units are in a location without proper water drainage, the soil can erode and cause them to sink. Incorrect installation can also cause them to sink earlier than expected, especially if the base was not properly prepared or not compacted sufficiently. In any of these three situations the only solution is to lift the pavers, fill the gap with sand and replace the units. This should be done by a professional, to ensure that the untimely sinking is prevented.